The present article looks at mind and consciousness from the perspective of the eminent Indian philosopher, Jiddu Krishnamurti. He believed in total awareness as being essential for a free mind. Human beings always learned from their past, and it was important that they looked inwards and freed themselves from self-perpetuated torment. It was also necessary that they avoided repression. The society in which we live should be organic, where, although individuals had no choice but to dwell in that society, it was one where the interests of the individual and society were the same. He also maintained that religion was always the result of past conditioning. A mind should be investigative and scientific. One could not get pleasure without difficulty, for which living in totality, not in segments, was a must. We often dwell on one part of the consciousness and miss its holistic aspect. One must uncover the mind layer by layer to achieve complete growth. Deeper delving into it and a study of J. Krishnamurti's philosophy is a must for the understanding of human consciousness, in a manner that is simple, yet abstract and deep. Jiddu Krishnamurti (1895 - 1986) was an eminent writer and speaker on philosophical and spiritual issues, including psychological revolution, the nature of the human mind, consciousness and evolution, meditation, human relationships, and bringing about positive social change. Maintaining that society was ultimately the product of the interactions of individuals, he held that fundamental change in society could emerge only through freely undertaken radical change in the individual (Krishnamurti, 2008  ) . He stressed the need for a revolution in the psyche of every human being and posited that such a revolution could not be brought about by any external entity, be it religious, political, or social. It had to be brought about by a holistic transformation from within, and an insight into the various layers of one's consciousness (Krishnamurti, 1987  ). Born into a Telugu family, in what was then colonial India, he lived, in his early adolescence, next to the Theosophical Society headquarters at Adyar, in Chennai (earlier, Madras). He then came in contact with influential theosophists, Annie Besant and C.W. Leadbeater, who educated him, believing him to be a future spiritual leader. However, Krishnamurti later broke away from the Theosophical Society and traveled internationally as an independent speaker and writer on fundamental human issues. He held many dialogs with eminent physicist David Bohm, and several Buddhist scholars and Jesuits. Whether discussing politics with Indira Gandhi, debating philosophy with Rupert Shedlrake and Iris Murdoch, or challenging the audience to test the truth of his words, Krishnamurti engaged fully with every aspect of the human condition (Fouere, 1969  ). He also addressed the United Nations on the subject of peace and awareness and was awarded the UN Peace Medal in 1984. Neither Krishnamurti's style of writing, nor his language, nor ideas, can be discounted. They are the major factors that made so many people follow him. He disregarded the stature of being a holy man, sadhu, saviour, and messiah. His simplicity of ideas flowed even through his language. Nothing was too complicated. His English was wonderfully elegant, British bred after all (Fouere, 1969  ) . Rene Fouere calls his style simple, adapted to psychological investigation, and free of all mythical or religious reference (Ibid  ). He used terms and examples that were not subject to any pre-conceived ideas and prejudices, those that were not standard and boringly repeated in the past. His language was not meant to be convincing on first reading (Fouere, 1969  ). It only gave a viewpoint so simple that you would not be persuaded into believing it. Belief just happened. He questioned the most obvious, and prodded into the dodgy subjects of life and the truth. The method of using many contradictions by itself served his purpose of proving that he was a mere mortal; and it was we, humans, who needed to think and question life from within; and look for answers, not elsewhere, but within ourselves. As humans, we were always told what to do and what not to do; he believed we need not be instructed with steps of life, but merely awakened. Sometimes outright hurtful or targeting words used by him were only meant to awaken those who had become dormant (Fouere, 1969  ). The essence of his writings / teachings was not a learning system that had many steps. The idea was to start anywhere and eventually reach the same place (within you, through life). He did not offer a school or cult of any sort. Claude Bragdon wrote that Krishnamurti did not offer something more to life; instead, he was a subtractor of everything that stood between him and his maker, which was life itself (Bragdon, 2006  ). Krishnamurti believed life itself was God, and every action manifested itself with God. The description and writing of his subject may seem so simple that you may go over it again and again and still be left lost (Ibid  ). His teachings leave many people with unanswered questions, but like he said, truth was a pathless land (Ibid  ). Claude Bragdon summarized his teaching well in two words - trust life (Ibid  ). Most of our troubles came from our fear of life, religion itself being a refuge from that fear (Krishnamurti, 2000  ) . If we trusted life instead of fearing it, it would never betray us - only by ourselves could we be betrayed (Krishnamurti, 2000  ). Those who look to Krishnamurti for a new religion or a new philosophy would be disappointed. He does not offer something more, but always something less. The very simplicity of Krishnamurti's teaching confuses our sophisticated minds. His teaching shall seem anarchic and destructive only till the perception dawns that his blows are aimed at our fetters. It is then that we realise that life, unconditioned by personal fears, ambitions, and desires, is not a void but a plenum (Krishnamurti, 1987  ). The teachings of Krishnamurti do not have a school or organization, but, as humans with tendencies to categorize and organize, I am drawn to comparing him with Jean Paul Sartre, the father of modern existentialism. Krishnamurti's works also include the space of a human in the social and political scenario. Krishnamurti states so very well that one cannot know of something unless the other is also present. He gives the example of non-violence: one cannot know of non-violence unless you know what violence is. Life itself is a movement of relationships, and we try to manipulate and control it even in the most common events of life. For example, when someone praises us, we grow in pride, when someone insults us we have rage filled in us; and what we do is behave in ways that increase positive reactions and decrease negative comments; the point being that we are only living a half automated life, and doing something habitually. He emphasises that total awareness, and continuous awareness, will lead to living a non-habitual life, and no amount of discipline will do it — and once again, discipline is not freedom from the known (Krishnamurti, 1975  ). Krishnamurti does not trust ideals. He states that an ideal is what is not. A human cannot understand an ideal without knowing what the other part of it is. I cannot know what truth is without knowing what is false, and what non-violence is without knowing what is violence. Truth cannot be seen as an object of desirability or attained because of its vastness and context. It cannot be reduced to an intellectual formula for our brains, or eternity, and reduced to a mere objective perspective . One cannot 'Know' of something in the present. Even 'I' cannot know of its moment during self-enquiry other than the past, as the present shall not be understandable unless it passes into the past. Humans can only learn from their past and not from their present, as the present is this very moment. All introspection is a form of retrospection (Krishnamurti, 1986  ). Problems that affect our behaviour cannot be resolved without awakening the creative intelligence or the intuition within us. That will, in turn, fully grasp the circumstance and liberate us from our miseries. It is a fact that all self-consciousness is painful and is absent in the states of ecstasy and fullness. Krishnamurti states that when you are really happy and deeply in love, the 'I' is not. Liberation is a state in which all 'I' consciousness has ceased, because the duality indispensable to self-consciousness is no more. All our urges for personal aggrandizement, which have cost the world so much blood and tears, are merely a futile evasion of a fact, an endless search for the non-existing security, an absurd refusal to meet face to face, with one's own true condition. It is only in the full awareness of oneself that we can put an end to our self-perpetuated torment (Krishnamurti, 1996  ). It is well known that the power to think is what makes us different from other living beings, but this unfortunately is also the reason why we may consider ourselves higher in the order of nature. This very essential power is mostly used and abused over time. Our mind is misinterpreted, according to Krishnamurti, and we must start using it differently than it is used, and not as an object for self-protection and self-expansion. We are no more primitive humans, and survival instincts have to be abandoned so as to achieve higher awareness. He talks of how, if society has to remain truly human, it must be in a state of constant revolution and re-evaluation. The mind is being used more for ego-centred acquisitiveness and for personal growth and power, in turn lessening others opportunities. We must try and belong to an organic society and not an organised one; because an organised society will always follow a hierarchy; and the standards of morality may exist, but not necessarily in the nobler sense like that of an organic society . An organic society means that its members have no choice but to belong to it. However, it goes even further. It implies that they have no desire but to belong to it, for their interests and those of the society are the same; they identify themselves with the society. Unity here is not a principle proclaimed by the authorities, but a fact accepted by all the participants. No great sacrifice is involved. One's place in society may be onerous or undignified, but it is the only one available; without it, one has no place in the world. The opposite of this perspective, with rights and liberties granted to an individual, is what forms an organised society (Krishnamurti, 1986  ). This world is full of chaos and it is the human being who must understand that he is part of that chaos - the cause and the effect. Krishnamurti states that bringing of the unconscious to the conscious is the first fruit of intelligence. It marks the reaching of the human level and there should be no conflict. This integration of the entire mechanism of consciousness will open to awareness, vistas of perception and experience of affection and action beyond our boldest dreams (Krishnamurti, 2010  ). Krishnamurti statesthat every experience in our life is imprinted deeply in our mind whose strength will vary in pleasure and pain and will crystallise in our life later on. This sounds as familiar as Freud, who said childhood experiences form the base of our adulthood and our adjustment to life; but it is more than this. Krishnamurti goes on to say further, that every action we try to connect positively or negatively to, comes back to form a habit, and does not allow a free mind to grow. Sometimes, even suffering is based on our habits and when we try to overcome one habit, we form another; and eventually, as humans, we form the habit of repression. We must understand that there is no stopping of habits, but rather only a cessation. We have to understand it and overcome it, which is acquired through great alertness and patience. The idea of a free mind is to look inward with this patience and alertness. On doing so, we free ourselves of the thinker who cages us. Once we destroy this cage of controlled thoughts, man finds a new freedom, which is not a freedom from painful experiences, but a release from the scar these experiences used to leave on the mind (Krishnamurti, 2000  ). According to Krishnamurti, we all follow a religion blindly, out of past conditioning or fear. We do not question or enquire what we may believe or not believe out of fear. And who is to be responsible for this - our elders who condition us to believe without questioning. What we are doing out of fear, or so-called belief, must be questioned. He states that a true religious mind is free of fear, blind faith, and contradiction. All religion is followed by tradition, whether it is religion that is 2000 years old, or 200. The list of must do's in any religion should be questioned by itself. A mind should be investigative and scientific in its approach, and not bound by something, or compelled. Religious matters make humans irrational, insane; and all these build the walls of our conditioning. The beginning of self-knowledge is the beginning of the religious mind and not the knowledge of the supreme self; because that will again be belief in authority; and authority makes us imitate, and dictates; and we have to learn to free ourselves from this. A religious mind does not separate the inner world and the outer. It is the unitary movement of the tide that goes out and comes in; and only that mind, which is free and enquiring, can perceive that which is immeasurable (Krishnamurti, 2008  ). Feeling is a part of the mind, as per Krishnamurti. The mind includes desires, love, jealousy, emotions, everything. It includes contrary beliefs, double minds, and all that we understand and feel. What is different is its manifestation and its intensity. The problem is not about feeling right or wrong, because humans will feel. What needs to be changed is the greed to have many things: people want the good things of life and yet want to feel contented and peaceful. The former brings about the need to acquire things, have power / prestige, and be ambitious. To have both is not possible: a real mind has no place for ambition and acquisitions. Pleasure is not difficult, but with it come difficulties; but we want pleasure without difficulties. It is only when the mind is capable of living in totality that remorse, difficulty, and pain will have no meaning and feeling to it (Krishnamurti, 1976  ). According to Krishnamurti, living in totality involves not looking at life in the form of segments or as an idea, but rather as a series of ideas and segments; and experience various facets of life at the same time, along with all the joys and sorrows in each facet. The less divisive we are within ourselves, the more we shall be able to experience the totality of life (Krishnamurti, 2001  ). According to Krishnamurti, when one becomes aware of one's conditioning, one understands the entire consciousness. Consciousness is the total field in which thoughts, functions, and relationships exist. All motives, emotions, desires, pleasures, fears, aspirations, longings, hopes, sorrows, joys, and inspirations are in that field. Consciousness can be divided into the active and the dormant, the upper and lower levels. All daily thoughts, feelings, and activities are on the surface, and below them is the subconscious, the aspects with which we are not familiar, which express themselves occasionally through certain imitations, intuitions, and dreams. We are occupied with one little corner of consciousness, which is most of our life; the rest, that we call the subconscious, we do not even know how to get into. The subconscious does exist and it is as trivial and stupid as the conscious mind; as narrow, as bigoted, anxious, conditioned, and tawdry. When one is aware of the totality of consciousness then one is functioning in full attention, not partial attention. In such a state there is usually no friction. Friction in life arises when one tries to divide one's consciousness (Krishnamurti, 1983  ). We live our life in fragments. We are one person at work, another with friends, and another at home. A mind that is fragmented shall never be aware of full consciousness. One must uncover one's mind, layer by layer, in order to understand the fragments one by one. This is a process that may take weeks, months or even years (Krishnamurti, 1983  ). Attention is not the same thing as concentration. Concentration involves exclusion, while attention excludes nothing. It is often that we concentrate on our own problems, our own ideas, and our own world, such that we are not objectively aware. Verbally we can only be superficial. What lies beyond cannot be put into words. One needs to be aware. Awareness about how we walk, how we speak, how we talk, and how we think, is necessary. It is with a choiceless awareness that doors shall open and one would know a consciousness in which there is no conflict and no time (Krishnamurti, 1983  ). Once we change ourselves, we can change society and the world in which we find ourselves. Understanding ourselves marks the beginning of wisdom (Krishnamurti, 2001  ). Freedom is found in the choiceless awareness of our daily existence and activity. For Krishnamurti, every human with a mind to think will have an interpretation of the same. To be aware might not necessarily mean to give up on life and look for the internal truth, but to be able to live peacefully with an understanding of the life one leads, the relations one shares with one's environment, and one's family and friends (Krishnamurti, 2008  ). A concept very similar to that of dharma, which I cannot help but compare it with - put simply as - Live your life the right way; do what you have to and be a good human being; and maybe that will lead to the final freedom. Although understudied, Indian philosophers like Krishnamurti have a lot to add to the general philosophy of consciousness and mind. Simplicity and elegance mark Krishnamurti's work and writings, but one needs to put in deep thought to understand his concepts. It is essential that readers and researchers in the philosophy of mind and consciousness study Krishnamurti, to gain further insights into our mind, into consciousness as a concept, and human evolution, learning and growth in general. Contemporary thought may have a lot to learn by a scientific study of mind and consciousness from the perspective of the eminent Indian philosopher Jiddu Krishnamurti. Awareness of the self is an essentiality for a free mind. We have always looked at our past and troubled ourselves, but it is important that we dwell inwards and free ourselves from our own ridicule and guilt. We must do this to avoid repression and self-blame. Society can be organised or organic. An organic society is preferred as per Krishnamurti, where individuals have no choice but to dwell in that society, but one where the interests of the individual and of society are the same. Religiosity and orthodox thought is often the result of conditioning from an early age. One must cultivate an investigative and scientific mind. There is no pleasure without difficulty; and living in totality, not in segments, is a must. We often just dwell on one part of consciousness and miss its holistic nature. One must uncover the mind, layer by layer, to achieve complete growth. It is very important that we promote self-awareness and develop an insight into the various layers of the self for a complete understanding of the mind and consciousness. 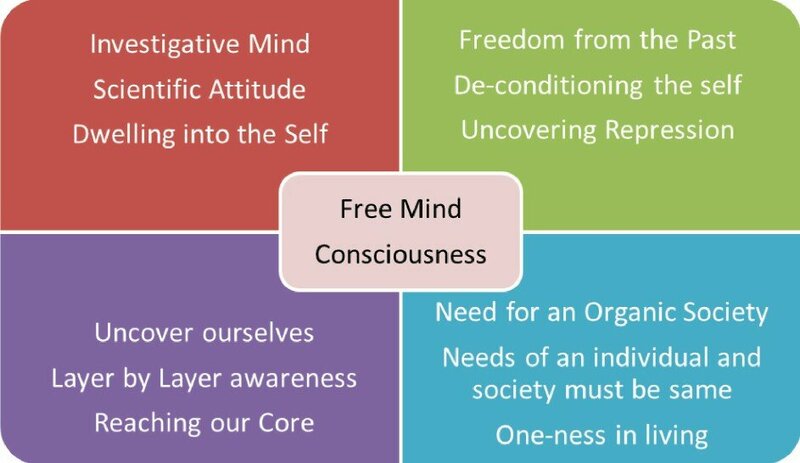 We have to free ourselves from past conditionings and uncover our self, layer by layer, for a holistic understanding of consciousness, and for personal growth. This is my original, unpublished work, not under consideration for publication elsewhere. Do the teachings of Krishnamurti hold relevance in the modern understanding of mind and consciousness? Does the philosophy of Krishnamurti give us new insights into the human mind, and does it provide further impetus for studies in human consciousness? Do Indian philosophical concepts of mind and consciousness need to be understood in, and compared with, Western concepts, and the Western context, to understand them better? 1. Bragdon C. More Lives Than One. New York: Cosimo Books Inc; 2006. 2. Fouere R. Krishnamurti: The Man and His Teaching. Mumbai: Chetana Publishers; 1969. 3. Krishnamurti J. The First and Last Freedom. New York: Harper One Publishers; 1975. 4. Krishnamurti J. Beginnings of Learning. London: Gollancz Publishers; 1976. 5. Krishnamurti J. The Flame of Attention. New York: Harper Row Publishers; 1983. 6. Krishnamurti J. The Future of Humanity. New York: Harper Row Publishers; 1986. 7. Krishnamurti J. The Awakening of Intelligence. New York: Harper One Publishers; 1987. 8. Krishnamurti J. Total Freedom: The Essential Krishnamurti. New York: Harper One Publishers; 1996. 9. Krishnamurti J. Truth and Actuality. Chennai: Krishnamurti Foundation; 2000. 10. Krishnamurti J. You are the World. Chennai: Krishnamurti Foundation; 2001. 11. Krishnamurti J. In the Problem is the Solution: Question and Answer Meetings in India. Chennai: Krishnamurti Foundation; 2008..
12. Krishnamurti J. Freedom from the Known. London: Rider Books, UK; 2010. Avinash De Sousa is a consultant psychiatrist and psychotherapist with a private practice in Mumbai. He is an avid reader and has over 95 publications in national and international journals. His main areas of interest are alcohol dependence, child and adolescent psychiatry, mental retardation, autism, developmental disabilities, neurobiology and interdisciplinary consciousness studies. He is also the academic director of the Institute of Psychotherapy Training and Management, Mumbai. He teaches psychiatry, psychology and psychotherapy at over 18 institutions as a visiting faculty.